The centenary of the first attempt to cross the Atlantic by air—a flight in an ungainly, hydrogen-filled blimp [pictured below] that ended in near-disaster off Bermuda—was commemorated with a permanent exhibit at the Smithsonian Institution in Washington, DC. The pioneering 1910 flight of the airship America was long consigned to footnote status by aviation historians. But given the ambition of the six adventurers—and one feline—involved, the endeavor is being reappraised by scholars. The America‘s attempt to cross the Atlantic came just a decade after the first modern dirigible was launched and seven years after the Wright Brothers’ motorised glider sputtered into the air at Kitty Hawk, North Carolina. The airship took off on October 16, 1910, from New Jersey and remained aloft for 38 hours until it was forced down just off Bermuda due to a combination of engine problems and bad weather. Though the America failed to cross the ocean, the crew—including American newspaper publisher Walter Wellman, who led the flight attempt, and “Kiddo,” a feline stowaway discovered after take-off—was rescued. 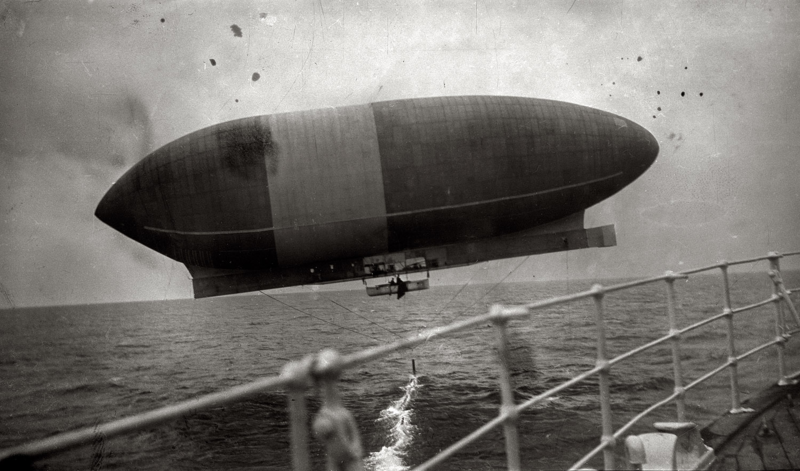 In fact, the first wireless message from a powered aircraft was sent from the radio position in the airship’s lifeboat. Wellman had purchased the sturdy lifeboat from an English firm as he was preparing to attempt the first powered flight across the Atlantic. The boat was 27 feet long with a six-foot beam and was constructed of three thicknesses of mahogany veneer. In addition to its basic role as a refuge for the crew should they be forced down at sea, the lifeboat doubled as a kitchen, pantry, dispensary, smoking lounge and radio position. It also served as a hiding place for “Kiddo” the cat. 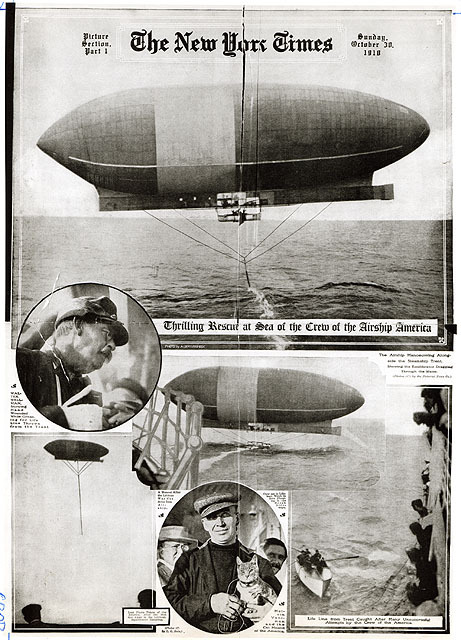 “After a hazardous operation, with the airship being blown along at speeds of up to 25 knots, the lifeboat was eventually lowered safely into the sea, complete with all crew, including the cat. The airship, still airborne, and now considerably lighter, vanished over the horizon. Mr. Wellman retired from the field, but Melvin Vaniman, his chief engineer, began planning for a transatlantic flight of his own. Frank Seiberling, the founder of the Goodyear Tire & Rubber Co., agreed to manufacture the gas bag for the airship that would be known as the Akron, in honor of the company’s hometown. Mr. Vaniman decided to reuse Mr. Wellman’s lifeboat in his attempt. On July 2, 1912, after a series of test flights, aeronaut Mr. Vaniman and his five-man crew steered the Akron up and away from his Atlantic City, New Jersey, hangar. The airship had barely crossed the coastline when, 500 feet in the air, the 11,300 cubic meters of hydrogen in the gas bag caught fire, plunging the crew to their deaths. The lifeboat was salvaged from the shallow coastal waters and shipped back to Goodyear, where it would spend the next 98 years in storage at the company’s Wingfoot Lake airship facility outside Akron, Ohio. Recently the Goodyear Tire & Rubber Co. donated the historic lifeboat to a new Smithsonian display commemorating the America‘s attempted ocean crossing.